STS-124 Mission Specialist Mike Fossum participates in the mission's first spacewalk. 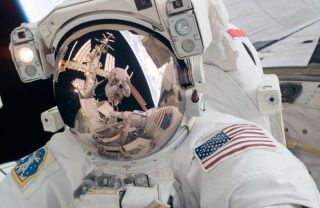 Visible in the reflections of his helmet visor are various components of the station, Earth's horizon and astronaut Ron Garan. Futureastronauts might better endure exhausting spacewalks with the help of a handy liverdrug. Thedrug captures free radical molecules produced during heavy exercise that coulddamage muscle tissue and cause fatigue for spacewalkers already facing the muscle-wastingeffect of weightlessness. "Astronautsreport that six to eight hours of extra-vehicular activity is as exhausting as runninga marathon,? said Michael Reid, head physiologist at the University ofKentucky who leads an ongoing study. ?The muscle groups most affected are thehands and arms." NASAtries to limit the duration of its spacewalks to about 6 1/2 hours on average becauseastronauts become tired working in their bulky spacesuits. Future astronautsmay have moreflexible spacesuits to work with, but researchers still look to counteractthe muscle fatigue in the shoulders, arms, wrists and hands. Forexample, NASA?s newest spacesuit glove modification wraps areas prone topotentially dangerous scratches and tears with a tough material dubbed?turtleskin.? The change did away with cumbersome, mitten-like glove coversthat, despite protecting against tears, enhanced hand fatigue during tasksrequiring fine manipulation. Reidfirst thought of using N-acetylcysteine (NAC) for spacewalkers after investigatingthe 50-year-old drug to treat patients on Earth. NAC is already approved foruse in humans to protect the liver against drug overdose, but several studieshave shown that the antioxidant drug can also increase muscle endurance by anaverage of 15-20 percent. ?We?restudying NAC because it?s the only game in town,? Reid told SPACE.com,noting that the drug?s safety record meant it should not hurt volunteers orpatients in studies. His research group still hopes to find a similar drug to NACwith even fewer side effects for astronauts. Asa member of the National Space Biomedical Research Institute (NSBRI), Reidreceived $1.2 million in funding for his study through August 2009. Successfulresults from the study could lead to use in spaceflight within two to fouryears, depending on NASA approval. However,treatment for Earth patients suffering from muscle fatigue could theoreticallygo into effect tomorrow if studies proved positive, Reid said. He credits NSBRIwith backing research that can improve human health on Earth as well as inspace. ?I?mlooking out my office window at three different hospitals, each with patientssuffering from premature muscle fatigue and weakness,? Reid said. He added thatthe NAC study stands as an example of ?space research that?s driving themedical spinoffs? assuming that the drug proves beneficial, he added. Reid?slab also has a longer-term focus on slowing muscle atrophy for astronautsduring long space missions. Astronauts currently use a combination of strengthtraining and aerobic exercise to keep fit in zero-G, but researchers mayeventually give antioxidant or other drug treatments to help supplement theexercise.